The human body needs heat for its proper functioning. Heat is produced by the body too. The heat is produced in the body by the working of the internal organs, the foods we eat, metabolic activities, alcohol, caffeine and the usage of various drugs. These foods that increase the body temperature must be avoided at all costs. More heat in the body affects the organs and their functions. An optimum temperature of about 36.7C is required by the body for its normal working. A slight deviation in the body temperature is acceptable. For some people external temperature also increases the body temperature. No matter what the external temperatures are, the ideal body temperature is maintained so as to enhance the proper working of the body system. Rapid increase or decrease in the body temperature results in health deterioration. Prolonged contact with the sun results in the rise of body temperature. 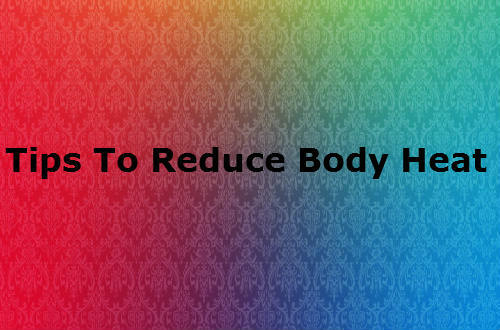 Below are some of the tips that help in reducing the body temperature of human beings. We have to use coconut oil rather than other oils such as almond oil, corn oil and other bran oils. Coconut oil helps to reduce the body temperature. Tender coconut helps to lower the body temperature in those when consumed. During summers about three coconut water must be drunk in a week. Nuts rapidly increase the body temperature so their usage must be reduced to about two or three times a week. Refraining from fat causing foods is a better way to maintain body temperature. Junk foods like chips and fast foods also increase the body temperature. So we must avoid them. High blood pressure also causes rise in body temperature. We must take medications for it to decrease the body temperature. Staying away from caffeinated and alcoholic drinks also helps in lowering the body temperature. Spicy foods intake must be curtailed because they soar the temperature of the body. Salt must be taken in moderation because it has got a bad rap of increasing the temperature of the body. The first thing that comes to the people’s mind when discussing the remedy to lower body temperature is water. It hydrates the body and keeps the various organs cool always. Drinking a cup of water or taking a bath in cold water or soaking the feet are the various ways by which water helps to lower the body temperature. Sandalwood can be mixed with water to make into a fine paste to apply on chin and temple to benefit from it. Pomegranate is a superfood as it is loaded with all nutrients needed for the body. It flushes the toxins from the system, boosts brain activities and increases the blood circulation in the body. The juice when consumed every morning along with a teaspoon of almond oil will maintain the body heat. This juice can be drunk by people of all ages. Fenugreek seeds is an excellent spice that is used to make delicious home recipes. They also lower body temperatures. A handful of fenugreek seeds can be eaten or they may soaked in water overnight. In the morning they may be blended into a paste and applied on the head and left to remain for about a quarter of an hour. Then the hair may be rinsed with cool water. The fenugreek seeds thus lowers the body temperature. A handful of poppy seeds can be eaten everyday to minimize the temperature of the body. Poppy seeds are opiates so they must be eaten in moderation. Eating poppy seeds at night helps to induce a sound and a good sleep thus enabling to lower the temperature of the body. An excellent remedy to lower body weight is having a drink of milk mixed with either honey or butter. The way to prepare this drink is mixing two tablespoons of honey or butter to a cup of cold milk. It should be drunk every morning. If we have high cholesterol then we must not mix butter with cold milk. We can go for honey which is acceptable to people of all ages. Sandalwood can also be mixed with milk to apply on the body. Apricot juice can also be mixed with honey. Fruits and vegetables that are rich in citric acid and vitamin C respectively are essential to maintain an ideal body temperature. The juices of the citrus fruits like lemon, orange and lime must be consumed more in summer. Vegetables rich in vitamin C must also he tried to get a wide range of benefits. Buttermilk contains more amount of probiotics that help to substitute for the nutrients lost in the sweat. It helps to regulate the inner body temperature. Excess of body temperature results in the formation of rashes on the skin. Peaches help to soothe the rashes and regulate the body temperature. These two fruits are readily when the summer season approaches. Watermelon has a rich quantity of melon which constitutes to about 95 % of its size. A cup of watermelon juice thrice a week can help to lower the temperature of the body. The skin of the fruit is also inverted on the head for the same desired effects. Honeydew melon is such a tasty juice that people of all ages like. It slashes the temperature of the body. Aloe vera is used in the beauty industry. Their vast uses were not attended during the ancient days. But nowadays people make use of aloe vera in all fields of humans. Take two or three leaves of aloe vera and cut them in the middle to collect the gel. Add a little salt to it and mix them in water. They can be drunk. Also face wash can be done using this juice. It slashes the body heat. Cucumber can be eaten as it is or can be drunk as a juice. Cucumber treats acne and rashes formed on the skin due to heat. Mint leaves are prescribed by doctors to patients on a diet. Like cucumber it also slashes the body temperature and frees us from sores and pimples. Radish is rich in water content and has a lot of vitamins. It cools down the internal body temperature. It is efficiently used to fight stress and stroke n human beings. Lemon is known to cool the body temperature. Do not add sugar to the lemon juice as it is unhealthy. Salt or honey can be added instead. These leaves are boiled in water. It is then filtered and the strained water is then drunk. It soothes the internal temperature of the body. The boiling should not be more than for 20 minutes. Honey can also be add as a sweetener. Amla is a vital remedy for many illness. Amla are eaten raw or powdered to be drunk as a tea. It is a rich source of vitamin C which helps in soothing the internal body heat. Amla juice can be made by adding lemon juice and honey to it. It serves as a remedy for all illness.